Back in the barely remembered, distant era that was beer in 2012, back when many argued that craft beer was just a fad that would fade away as it had done in the past, when you'd be told in no uncertain terms that the revolution would never take off in Brisbane and when execs at the biggest beer companies swore blind 6 percent ABV, highly hopped, bitter IPAs would never work in Australia, Moon Dog released The Magnificent Mullets. By the standards of the fledgling brewery, they might not have seemed that remarkable. Sure, they had daft puns for names and dafter artwork on their labels, but they didn't come with silly ABVs, hadn't spent time in barrels and didn't come with a bitterness rating heading towards three figures. Yet, with hindsight, they're as forward-thinking as anything the brewery has produced (which has included what may have been Australia's first milkshake IPA and its first Brut style IPA). 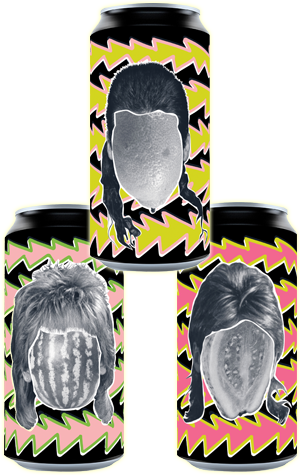 Now they're back, this time in cans and with Mel(on) Gibson, who's not enjoyed the best of times in the intervening period, given the chop in favour of Melon DeGeneres. The trio all sit at 4.5 percent ABV and, one assumes, feature different fruits added to the same base beer. In the case of DeGeneres, they've injected the beer with a fair amount of sweet watermelon character, with that fruitiness underpinned by a little lacto funk that builds over time. Billy Ray Citrus, featuring a trio of citrus fruits, initially presents as the leanest and sharpest of the three and possesses a deeper golden hue too. As it warms, freshly squeezed orange comes to the fore, turning the beer into a second cousin of La Sirène's Citray Sour. As for MacGuava, it's the cloudiest, has the densest of fluffy heads and is easily the most potent in terms of fruit character. Indeed, the guava carries right through from initial aroma to the back of your palate, making it the Mullet furthest removed from any traditional concept of beer. If such a thing even matters anymore.